Today is my daughter Annie's birthday! She loves coconut! 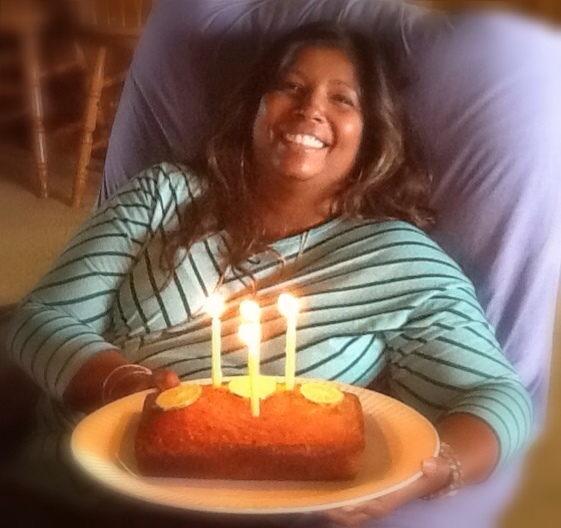 So, what better cake to make her than one loaded with coconut, lemon peel, and a delicious lemon syrup poured over the cake to seal in flavor and moistness?! This recipe comes from ~ BREAD MACHINE how to prepare and bake the perfect loaf, by Jennie Shapter. You can pick up a copy of this wonderful cookbook for under a dollar on Amazon. She covers ~ buying, using and programs for a bread machine, as well as, baking, cooling and storing bread and bread doughs. It also has a section with excellent photographs showing how to shape different loaves, how to braid bread, slashing, glazes, crisp crusts, and toppings. Using sourdoughs and starters, adapting recipes for use in a bread machine, troubleshooting, types of flours, leavens and salt, dough conditioners, liquids, adding herbs and spices, nuts, cheeses, veggies, fruits, meats. The book covers equipment you will use and different bread baking pans, rolling pins, tools. This is a very well thought out book covering every facet of bread baking. While I personally only use my bread machine to do the mixing, you can definitely learn how to bake breads using your bread machine. My favorite part of this cookbook is the photographs! They will inspire you to bake up some incredible breads from around the world! There is a chapter on flatbreads and pizzas, rolls, buns and pastries, sweet breads and yeast cakes, teabreads and cakes (this is where I found the recipe for Annie's birthday cake). The cake is mixed together in a batter bowl, but can actually bake the cake in your bread machine! How cool is that? I opted for my toaster oven . . . So, let's make a yummy Coconut Cake! Each recipe in this cookbook comes in small, medium or large. I chose to make the large recipe. 1 cup self-rising flour (or) to 1 cup of all purpose flour add 1 1/4 teaspoons baking powder and 1/4 teaspoon salt. 3/8 cup sour cream (I measured out 1/2 cup sour cream and removed 2 tablespoons from it, to get the correct measurement). 2 teaspoons grated lemon zest (my lemons are fine to use but, still green on the outside). If baking cake in your bread machine ~ Remove the kneading blade from the bread pan and line the pan with nonstick parchment paper or greased waxed paper. If baking cake in your oven ~ Preheat oven to 350F and line your grease your bread pan and line with oiled parchment paper. 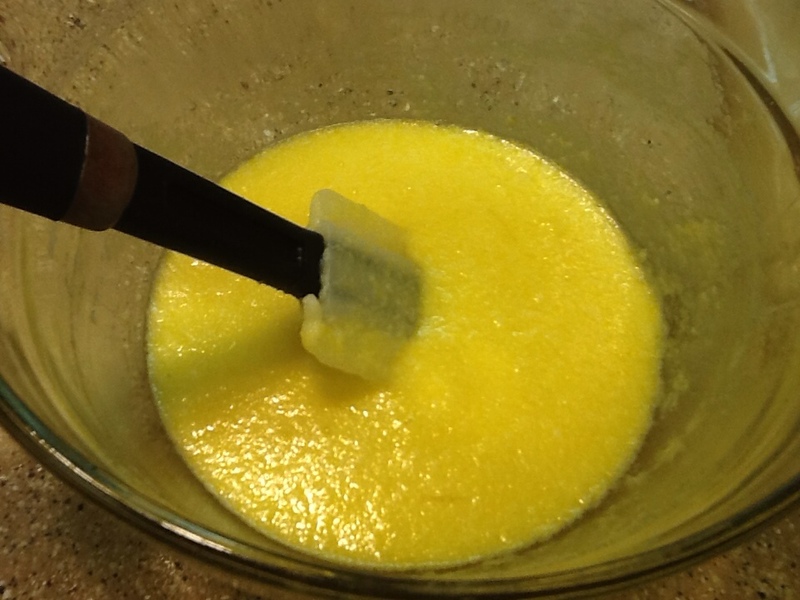 Cream butter and sugar together until pale and fluffy, then add eggs one at a time, beating well after each addition. Add coconut, flour, sour cream, and lemon zest. Mix together using a non-metallic spoon. Spoon into pan (once my pan is filled, I hold the pan a couple inches above the counter and drop it a 2-3 times on the counter to remove any air bubbles and to level out the batter). Using oven ~ set timer for 50-55 minutes; check for doneness by inserting a toothpick, it should come out clean. 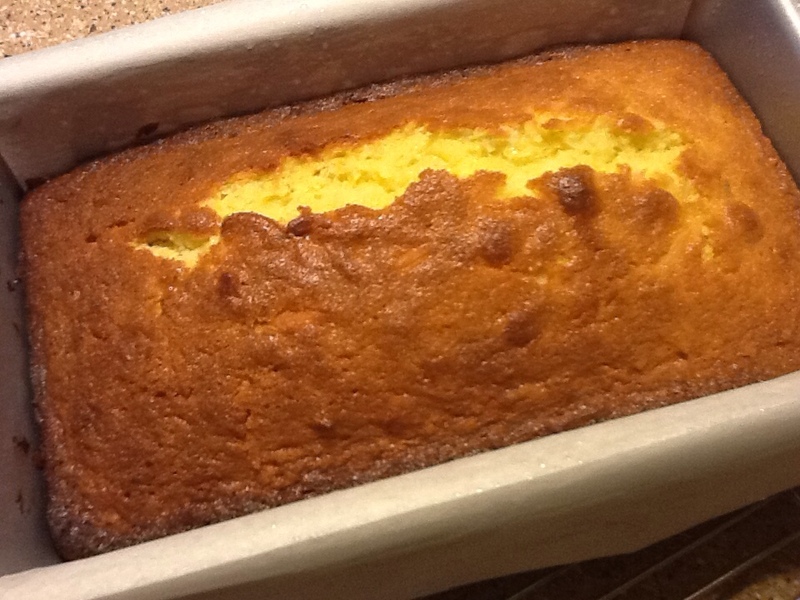 Cake may be served plain or with a lemon syrup. 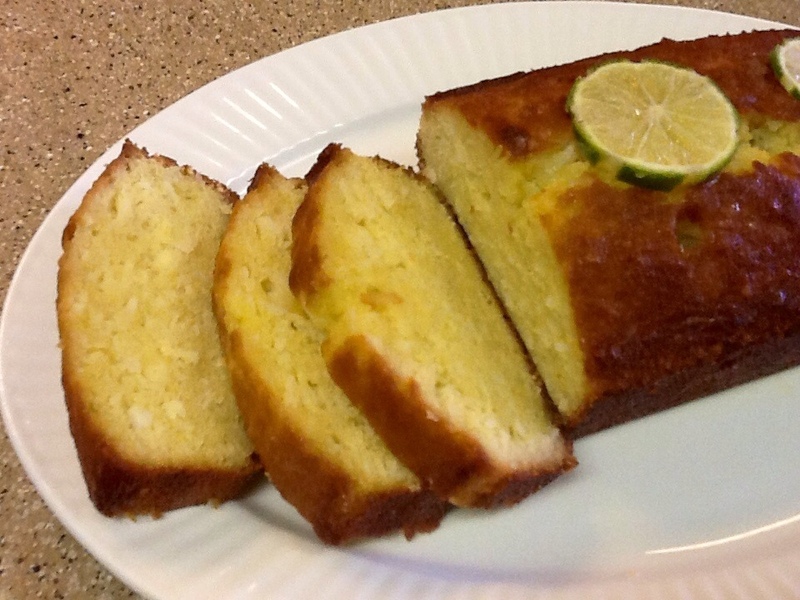 Lemon syrup drizzled over the top adds a great finish to this moist Coconut Cake! In a small sauce pan heat 2 tablespoons lemon juice with a scant 1/2 cup granulated sugar and 6 tablespoons of water. Bring to a boil, then simmer for 2-3 minutes. Drizzle hot syrup over warm Coconut Cake. Sugar and butter creamed together. Loaf pan lined with oiled parchment paper, ready for oven. Golden brown . . . absolute perfection! Drizzled with lemon syrup and topped with sugared lemon slices. I love the rich chewy textures the coconut gives this cake! It's like eating a lemon-macaroon cake! Annie and the girls dropped by this afternoon. She opened her gift from us ~ a big red batter bowl and some bamboo cooking utensils, They'll come in handy with all the baking she does! I lit the candles . . . we all sang a rousing rendition of Happy Birthday to You . . . Annie blew out her candles . . . I cut the cake . . . we all had a piece . . . It was delicious!!! . . . Over at Julie's!!! Moist, rich lemony cake filled with chewy coconut! Whst a perfectly wonderful combination ... Lemon and coconut. Yes Terence, it is a wonderful combo! 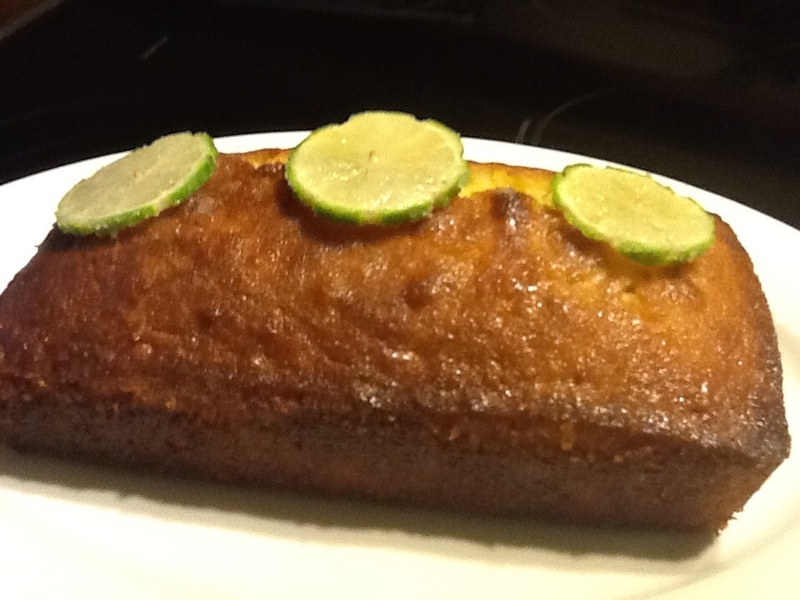 But, I'm thinking coconut and lime might be even better! 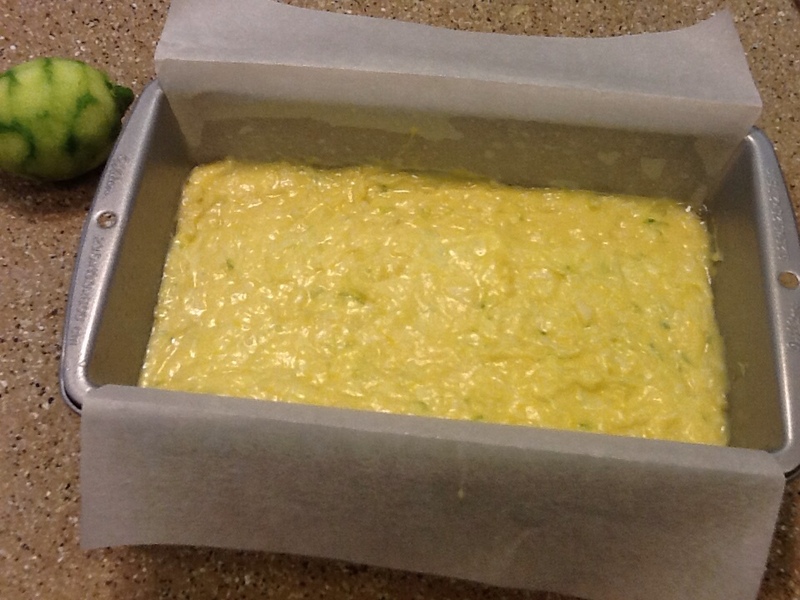 We have a little thornless Mexican lime with flavor-packed tiny "key lime" fruit that I just have to try this recipe out on! I'll let you know after we do a taste test!